New to Search Engine Optimization? 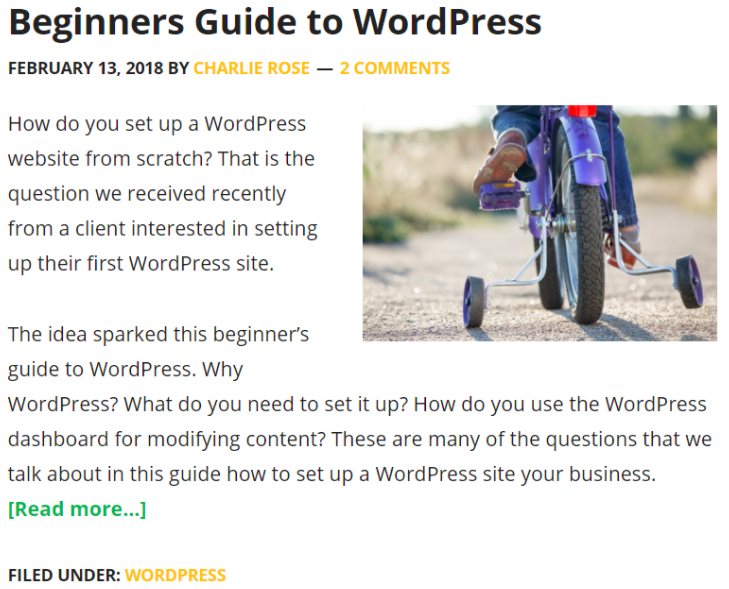 Our guide on how SEO works provides comprehensive information you need to get on the road to understanding Search Engine Optimization, or SEO. The term “search engine optimization” refers to intentionally improving a website or content for the purpose of increasing its organic ranking in search results. Search engines allow users to search the internet for content using keywords. Although the market is dominated by a few, there are many search engines that people can use. Most commonly a user enters a query into a search engine, a search engine results page (SERP) is returned, ranking the found pages in order of their relevance. How this ranking is done differs across search engines. Search engines, like Google, use a series of web crawlers and algorithms, that collect and analyze vast amounts of information into indexes to facilitate fast and accurate information retrieval. Search engine indexing is the process of a search engine collecting, parses and stores data for use by the search engine. The actual search engine index is the place where all the data the search engine has collected is stored. It is the search engine index that provides the results for search queries, and pages that are stored within the search engine index that appear on the search engine results page. This guide on how SEO works is a great starting point to help your search engine optimization efforts. With the information in this SEO starter guide, you should now have a better understanding of how SEO works and the steps you must take to achieve success with your website in search engines. Driving search engine traffic is not hard, but it does take a lot of work to make it happen. All of the suggestions discussed in this SEO guide help you break down the process into manageable chunks. Remember that not all websites need every step in this guide. However, a good percentage of websites can use the strategies here to have an optimized website for helping search engines and people find your website. If you still need help optimizing your site for search traffic, then feel free to reach out to me to discuss how we can help you grow your business. Index: Search engines, like Google, look for webpages that match your query. It does this by looking up your terms in their index, and searching for websites that most closely match the information you require. Crawl: The method search engines use for looking for new and updated content and web pages. Search engines, like Google, find these pages by crawling URls, via links, sitemaps, and social media signals. If search engines determine the content is good enough it will submit it to their index. Crawler / Spider: Automated software that fetches web pages from the open internet and adds them to their index. The ultimate goal of search engine optimization is to improve your site’s ranking so that you can bring the right people in from search engines. After all, 81% of businesses research their purchases on search engines. Additionally, 61% read product reviews prior to making a purchase. As a webmaster, marketing professional, or business owner, it is only natural to devote plenty of time, money, and resources to SEO. Through the right process, you can generate free, targeted, organic traffic to your website. While this sounds simple enough, there are three words in SEO that deserve most of your attention: the right process. Do you need an SEO company? When it comes to SEO, search engine algorithms are always changing. SEO strategies that work today may not work tomorrow. And what works tomorrow is not likely to produce results a few years in the future. 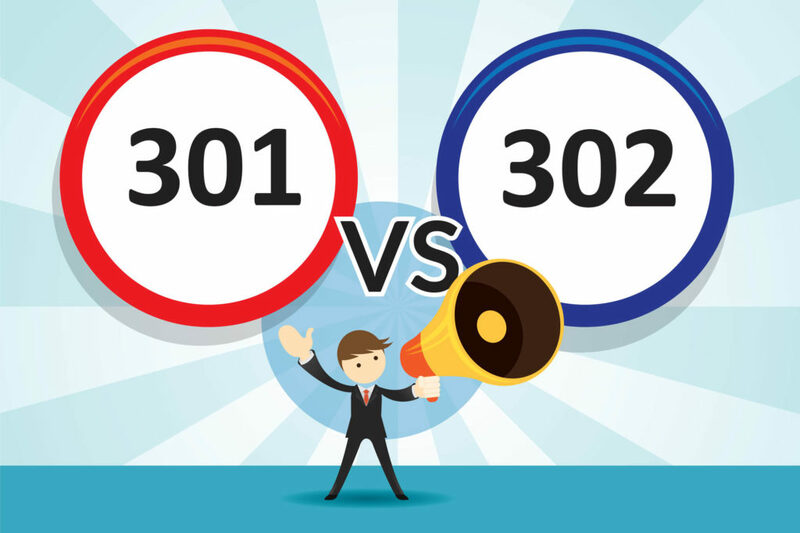 Because of the fluctuations in SEO factors, sometimes its makes sense to hire an SEO professional, versus learning SEO. Business owners need quality search engine traffic more than ever to drive leads and clients. The challenge comes you don’t have a complete grasp of how SEO works because you’re not in the industry. With so many people using search engines to research their products makes it an important part of your marketing strategy. How then can you find a good SEO company to help you with your search strategy? While there is no secret sauce to finding the right SEO company, below we go through a few recommended steps as well as what to avoid. If you’re considering hiring an SEO company, SEO Mechanic makes SEO happen, from the content to the code. We know the on-site, local, and technical SEO factors that improve site traffic and deliver higher rankings on all search engines. Cost Effective – SEO has been proven to be one of the most cost effective forms of online marketing, delivering a higher return over time. Stand Out – SEO can make your brand stronger, better and well recognized. People should find you at the top of search results. Drive Sales – Today, more sales offline are driven by research initiated on the Web. Open the flood gates and traffic keeps flowing. Targeted Prospects – SEO can attract targeted prospects to your website and increase conversion rates by delivering the exact solution to problems they are facing. There’s a better way to market your business, and we’re here to help. In the next section on how SEO works, we’ll discuss the following elements of SEO, Local SEO and Technical SEO. In short, technical SEO refers to any work that is completed in addition to content production. Consider this the foundation that gives your content the greatest chance of ranking at the top of the search engines. With the right approach to technical SEO, you make it easy for search engines to crawl your website and index your content. Without this, even the best content won’t rank well. In the next section on how SEO works, we’ll discuss the elements of SEO, on-page and off-page factors. All of the info below is general SEO advice, focusing on both on page and off page elements to help boost search engine rankings. The way your website (and business) is optimized can have a huge impact on its ability to rank in search engines like Google. Although best SEO ranking factors change often, it’s important to stay current with what’s working in the “here and now.” Even when search engines change their algorithm, many SEO best practices that were important in the past will remain essential in the future. Quality over quantity. Gone are the days of moving to the top of the search engine rankings with thin content. Content length is more important than ever before. Research. While you don’t want to stuff keywords into your content, it’s important to research keywords that people use to find your website. Be unique. Most topics have been covered time and time again. Even so, this doesn’t mean you can’t put a unique spin on your piece. Without high quality content, you’ll find it impossible to achieve SEO success. Can search engines easily crawl pages of your website? Do you have a system in place for managing duplicate content? Is your site optimized for mobile devices, such as smartphones and tablets? Do URL’s contain keywords related to the content? While every detail is important, some deserve a bit more attention than others. And this is where title tags come into play. Title tags—technically called title elements—define the title of a document. Title tags are often used on search engine results pages (SERPs) to display preview snippets for a given page, and are important both for SEO and social sharing. While that’s easy enough to understand, there are some additional details to become familiar with. When it comes to the wonderful world of search engine optimization (SEO), every detail is important. If you overlook one detail – no matter how inconsequential it appears – it could have a negative impact on your rankings and traffic. A meta description is used to provide an explanation of the content of a web page. For this reason, it should be accurate and concise. What steps have you taken to make your site a trusted authority in your niche? Do visitors spend time on your site, or quickly leave after arriving? How long has your website and domain been around? Is your website full of advertisements? Just the same as content, link quality is more important than quantity. Have you purchased links in the past? What is the anchor text distribution of your link profile? Has your website’s homepage and internal pages received links from trusted sources? You want your content to be shared as often as possible on social media. Focus on a variety of social networks, such as Google My Business, Twitter, Facebook, and LinkedIn. In the next section on how SEO works, we’ll discuss Google indexing your website. Do you want to get your site listed in Google search results? The first step is to have Google crawl your site to determine what information searchers will value. Follow the three steps below for Google to index your site. Before Google indexes your site, you need to create a sitemap of your website. The map helps Google identify what pages can be valuable to specific searches. The easiest way for WordPress owners to map their site is a plugin like Google Sitemaps or Yoast SEO. 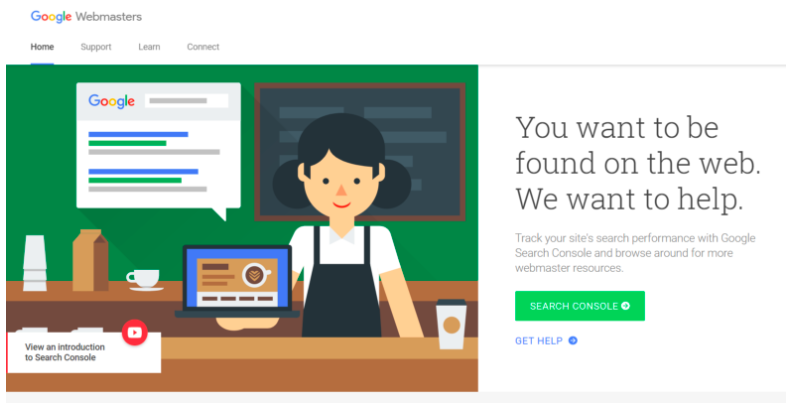 Once you set up your sitemap, you need to connect it to the Google Search Console (or Google Webmaster). If you use a Gmail account, you can connect the Gmail account to your Search Console Account. Otherwise, you need to set up a Google Account first. The next step is to add your website property to the Search Console. Enter the full URL for your site. Then verify your site. You have a few options. The easiest is to set up a Google Analytics account first, so you can track your traffic to your website. 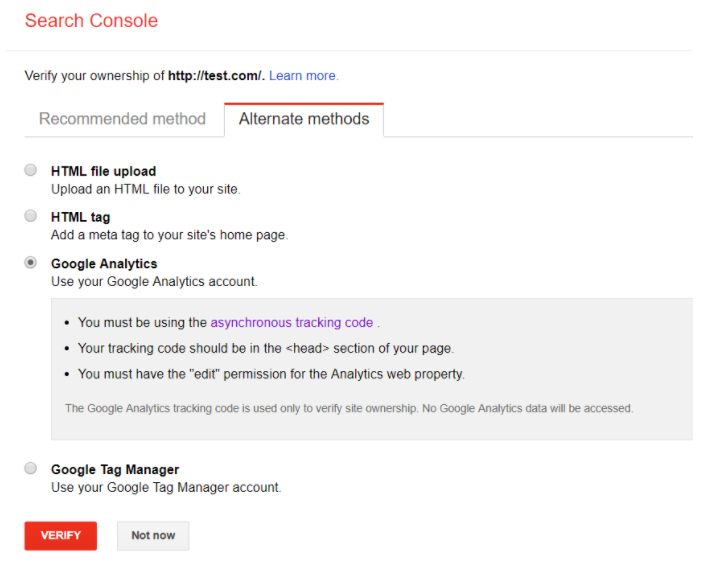 You can use a WordPress plugin like GA Google Analytics to connect your site and GA.
Once Google Analytics is set up, connect it to the Google Search Console. On-site SEO (also known as on-page SEO) is the practice of optimizing elements on a website (as opposed to links elsewhere on the Internet and other external signals collectively known as “off-site SEO”) in order to improve search engine ranking and visibility. Once Google crawls your website, focus on how to optimize every page for the most traffic. Here are on-page strategies to improve how your site appears in search results. Over the past decade, keywords have gone from search phrases to semantic phrases that help understand the intent of search engine users. Using keywords helps Google understand the central theme of each page. Therefore, use keyword research to create compelling topics that relate to what users need. 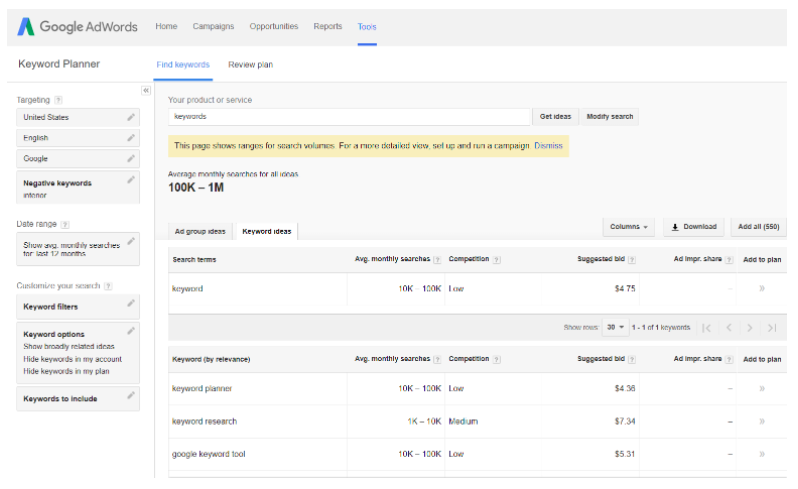 Use Google’s Keyword Planner tool to find the keywords your users will use. Keep in mind that you want to use money keywords. Those are the keywords that customers are more likely to use when they are ready to purchase a product. The more specific a search is, the more likely they have done preliminary research and are ready to buy. For example, a plumber would go after a targeted keyword like “leaking hose bibb” instead of the generic “water leak.” If you know what a “leaking hose bibb” is, you probably need help with that problem. 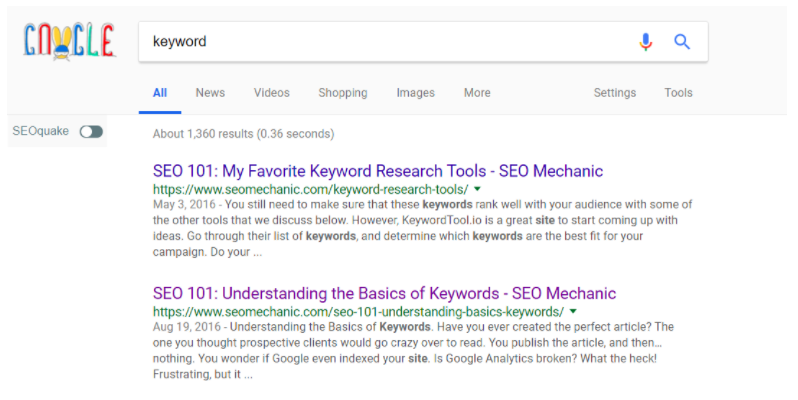 For more information about keyword research check out our SEO 101: Understanding the Basics of Keywords article. Every page should have a title tag. This page title should reflect the content you have on the website page based on your keyword research. 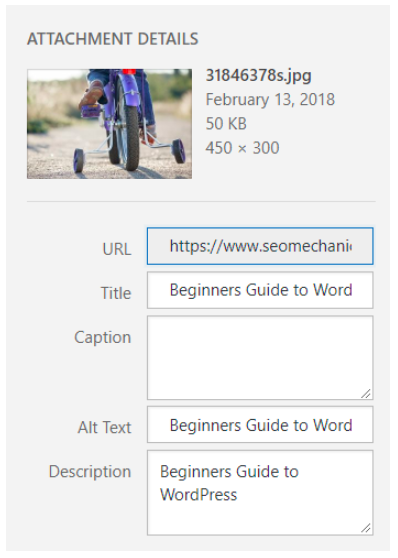 For example, if you sell red bikes on a page don’t title the page “Blue Bikes” or just “bikes.” Also, do not use generic page titles like “Untitled” or “New Page” that users often ignore. The advice might sound basic, but many marketers lose traffic because of these omissions. Visitors who come to a page not correctly titled spend less time on your site and more bounces (leave a website after visiting one page). Google tracks time on site and bounces to determine the value of your content and whether to deliver your page in future searches. Also, title tags show up in search results. Make sure you create a dynamic title tag that encourages users to click on your page. Finally, keep it short. You only have limited space for your title. Use it wisely, so people and search engines want to learn more. The meta description is a critical component of your on-page search results. As you guessed, this information describes the page in more detail than the title tag. If the page title is the enticement to visit your page, the meta description backs up that reason with logic. Furthermore, Google uses your meta description as snippets on the search engine. Similar to the page title, it does show up in the search results. The sitemap provides a structure for your entire website. The robots.txt then informs search engines which pages they should crawl. It is a root file on your site that helps search engines avoid blocked pages to display. That said, the robots.tx does not secure information. For this, you might need to make a page private or even password-protect the page to ensure Google does not crawl them. Also, when you use Robots.Txt, you often direct users to pages that are no longer there. 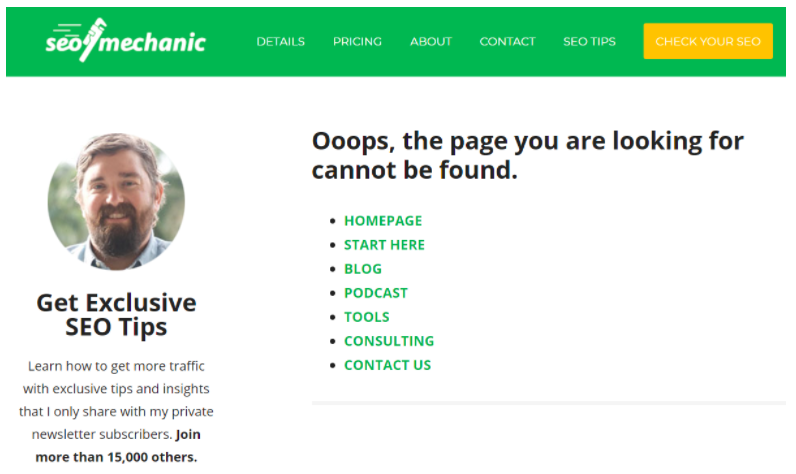 If that is true, you need to create a custom 404 Error Page re-directing users to another website page. Search engines ask for your sitemap to understand the structure of your web pages, so they know what pages to display on specific search results. 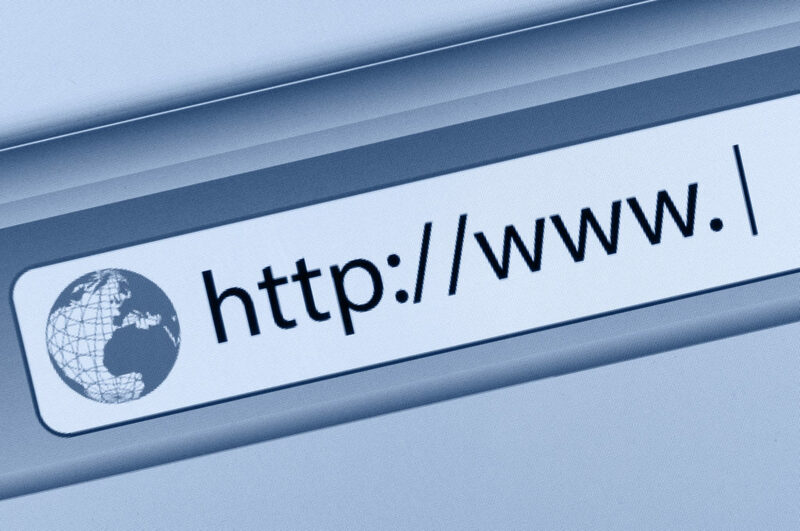 Here are a few things to keep in mind for your URL site structure. Google now uses site security as a ranking factor in their decision to give you more traffic. To accomplish this goal, you need an SSL Certificate. The SSL Certificate protects your visitors when they provide you valuable information (e.g., credit card info) on your site. The HTTPS markup indicates security. The way to tell if your site has an SSL Certificate is to check for the Secure logo next to the domain URL in Chrome or Firefox. Note: Make sure when you change your site from a non-secured to a secured website, you do not create duplicate pages. The S in HTTPS technically creates a second page on your website. Google does not like duplicate content because it does not help visitors to find the same information on multiple pages. As you continue to create more content for your site (ex, blog, case studies, etc. ), you need to break up the content into themes for your site visitors. Create a plan for what categories you create, because Google will crawl them to understand more about how your site operates. Did you ever find website links (see below) that seem to be a weird arrangement of letters, numbers, and characters? The question is will anyone human or robot understand the significance of the page from your permalink? Your URL should delineate the main ideas for your page to make it easier for Google to rank your site appropriately. 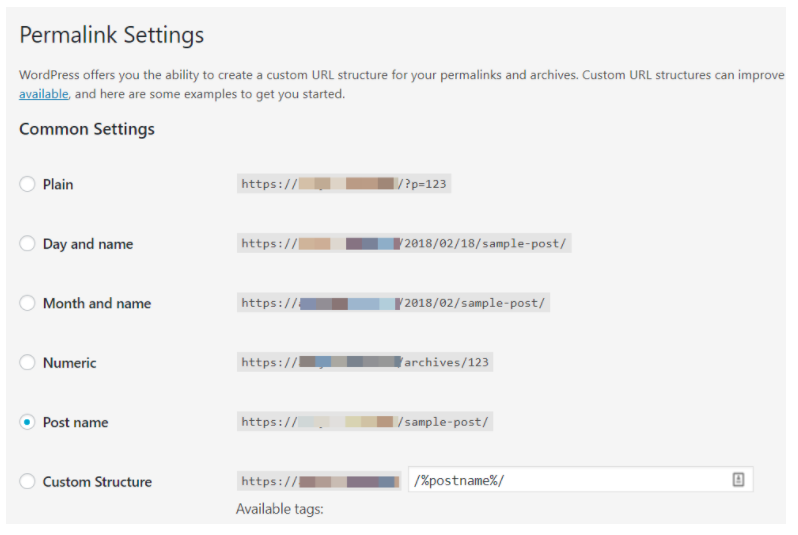 Use your title tags for your URL string, and maybe include the category as well. You can enter your page permalink after the domain name on WordPress. In the Permalinks Settings, which you can find on the left-side menu on the Dashboard. Choose the permalink structure that helps your site. If you are just starting, use a post name structure. Once Google understands your URL structure, you want humans to appreciate your site as well. Fortunately, the site categories and permalink structure provide you with a comfortable jumping off point. The first thing you need to do is create a home page menu. The navigation bar guides the visitor to the best pages they can use for their needs. Make sure your navigation is easy to find at the top of every page. Most visitors will not click the back button to see more information on your website. Your navigation should focus on how to get them to your services page to learn more about the different offers you have for your business? What is the most accessible path for them to take on your site to become a customer? The more you lay out the navigation of your customer path, the better the experience becomes for your prospects. A few years ago, content quantity drove better results on Google than quality. The Penguin and Panda algorithm changed this equation. Google looks more at intrinsic content measures now like how long users read the content or how many other pages they check out after reading your landing page content. Here are a few tips to help you create more quality content. Boring content does not drive more traffic; it just puts readers to sleep. Prevent this by understanding your audience, so you can create content you believe they want. The increasing array of website competition requires creating compelling, useful content for your niche. Did you know that Hemingway wrote at a 4th-grade reading level? It is not that he was not eloquent; just his style was simple and easy-to-read. This combination made him one of the most well-read novelists of the 20th century. You do not need to be Hemingway. However, you should focus on keeping your content simple, so your readers stay with your narrative. Start by assuming not everyone is reading your content knows the technical jargon. Then avoid long, windy sentences that readers need to review multiple times. Content writing is as much about the design as it is the words you use. 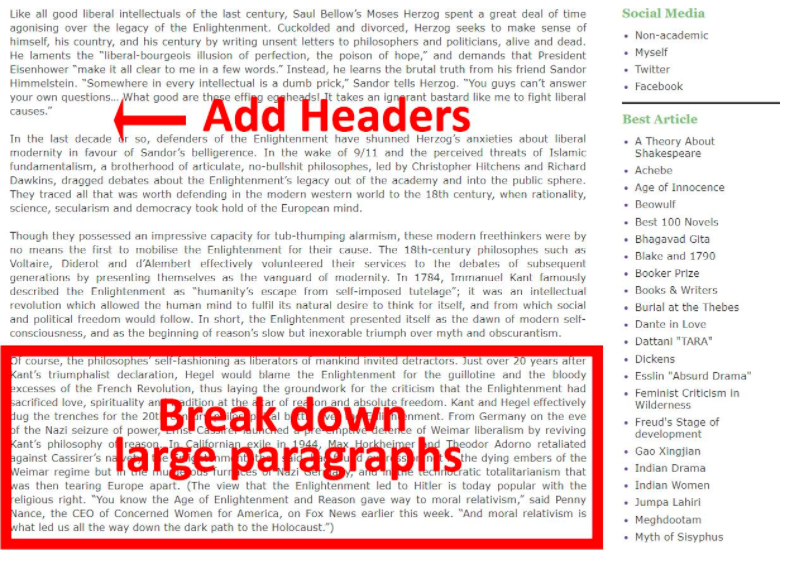 Break up the text, so readers can skim the main points and read the in-depth information they want. Here are a few ways to organize your content. Did you ever research a topic on Google and found all the results seemed alike? How excited are you to read the 5th result as you were the 1st result? More often you are frustrated by this point to find the answer to your question. Your content needs a fresh approach, or readers will wonder what the point of reading your copy in the first place? Remember that content needs to be for your reader; not you. Find a new angle to help them. SEO Content is for users, not search engines. Part of this equation is putting a fresh spin on the content you create. Inside your content, you will often want to link to useful content on other pages of your site. These links are helpful on many levels. First, they help your readers get more insight on a topic. Second, they add an internal link to highly valued content. Third, they improve Google’s understanding of your site content (see URL structures above). To connect this content, you use anchor texts. Keep your anchor text to 3-5 words at most. An anchor text links to a specific piece of content users would find helpful to learn more about the topic. The more specific you get with your anchor text, the more clicks you receive this text. Your anchor text should help users understand they can get more information about a complicated sub-topic at the following link. Adding 2+2=4 does not require an anchor text. However, going through different calculations for “pie” could use anchor texts to discuss the topic in more detail could use some backup information. The anchor link offers additional information for prospective clients to learn more. Make sure you link to relevant pages. Nothing worse than being led on a wild goose chase. If your links do not provide appropriate information, then Google will look at this unfavorably. Do NOT solely link to sites because you want more site traffic or keep people on the page longer. Make it a valuable piece of add-on content. Make sure your text links do not blend with the rest of the text. Hiding them just to add extra internal links on your site lead Google to think you are link-stuffing. Additionally, most links have a distinct color scheme along with an underlined text. The colors should be different from the colors in the accompanying text. The links below have a distinctive yellow or green color to help users identify them. Do not link to sites that have malware or those with low-quality content. Linking to them could reduce the quality of your sites search ranking. Be careful! Do not use too many of the same anchor texts. Google tracks if you use too many of the same anchor texts because they know you might try to influence your rankings. We talk below about the use of backlinks to improve your website traffic. For now, we want to discuss how you need to protect your reputation on your website by not giving it away to other sites who do not deserve it. To protect your website’s search authority, use a nofollow tag in links to third party websites. 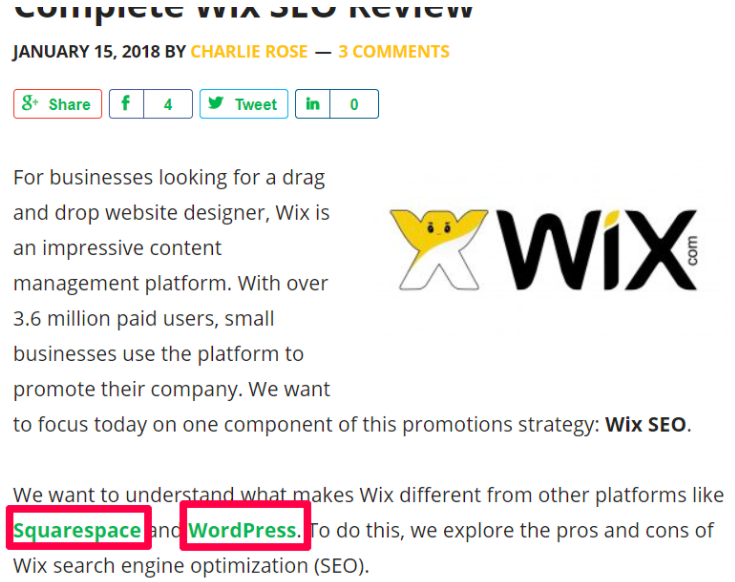 Often people add spammy backlinks in their comments to your blog posts. The Nofollow attribute tells Google not to follow the link, so it does not reduce your search trust and authority. 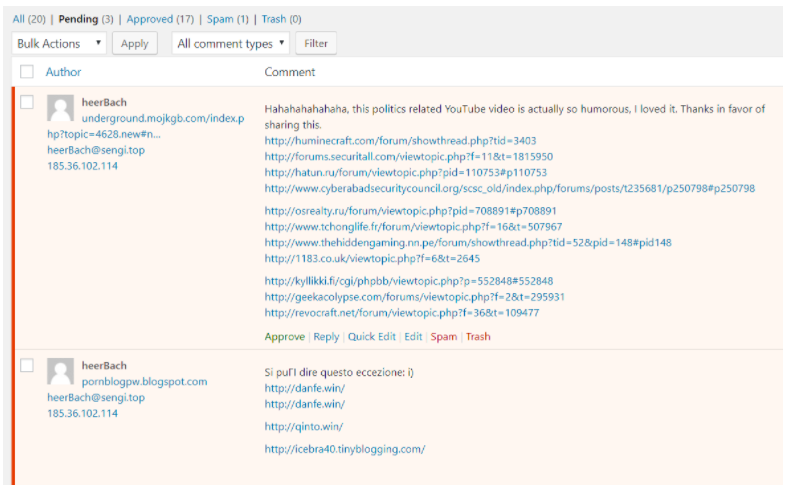 These comment spammers want to build their search traffic on your hard work. Bonus: When comment spammers see nofollow attributes on your website, they are less likely to even comment on your site. Another way to garner more search traffic is through pictures. Google has an image search feature comparable to traditional search. If you want to gain traffic from image searches here are a few strategies. An alt attribute or alt tag is the image equivalent of a text keyword. This tag is beneficial for search and accessibility reasons. Search engines still struggle to process image content. The alt tag guides Google to determine when to display the photo to searchers. Alternatively, people with visual disabilities might use the alt attribute to read the concept behind the image and follow along with traditional readers. When you use Alt Attributes, you need to update the filename as well. Otherwise, you could get images with alt tags like image01404020.jpg. The name above is not descriptive and can hurt your image search traffic. Additionally, you should keep your image filenames short and to the point. Too long and it might not get picked up by Google. They do cut off image filenames to a certain length. Having an image sitemap like your website sitemap helps Google crawl your images so that you can improve your search traffic. 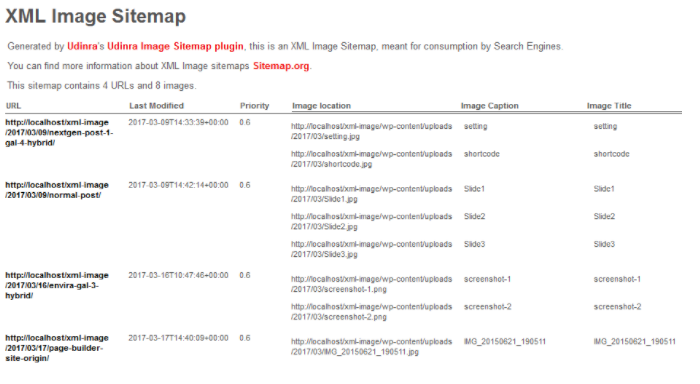 You can use a WordPress plugin like Udinra Image Sitemap. Note: If you want to use Udinra Image Sitemap it might have some compatibility issues with Yoast. 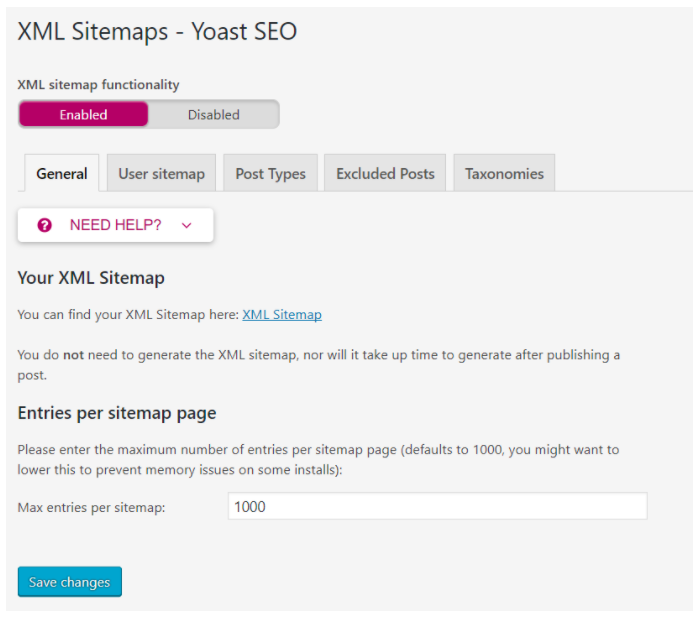 Look at the directions to see if Yoast already created an image sitemap. We discussed in the content above how heading tags separate content. However, we want to talk about how to use heading tags to improve your search results. Having quality heading tags provides a framework for your website page. It gives the structure to your content, so you can quickly break down the topic for your readers and Google spiders. Your heading tag organizes your website pages. Therefore, the heading tag text must inspire readers to check out more detailed information on the page. While you should not waste readers time with extra text anywhere on the page, you need to be particularly concise with your heading tags. Do not have heading tags longer than 50-70 characters. Keeping the heading tags similar in size makes it easier for Google to read the heading tags and identify subtopics on your post or page. Since heading tags outline the website, you need to use them appropriately. If you use them too much, then it could denigrate the quality of the heading tags you use. As you review this white paper, you can get an idea of the structure. More prominent topics use H2 tags, which subtopics are H3 tags. The title at the top is the H1 tag. Do NOT underestimate the importance of mobile websites for your search traffic. In the past year, made Google mobile-first indexing of sites a priority for their algorithm after more than 50% of searches started happening on mobile devices. Here are some strategies to makes sure you receive mobile traffic. Make sure you have a responsive site that works on smartphones, tablets, and other devices. Most WordPress themes built today are already responsive. The next step answers the question for you definitively. Test your website to make sure it is set up to be mobile-friendly. 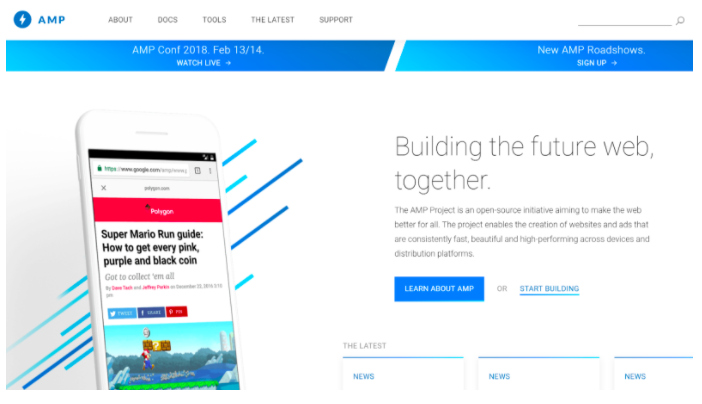 Google created AMP a few years ago to help mobile websites load quickly. It strips some of the regular features for a mobile site, but it increases your search ranking. If you have questions about the pros and cons of using Google AMP for your website, contact Charlie for a free consultation today. 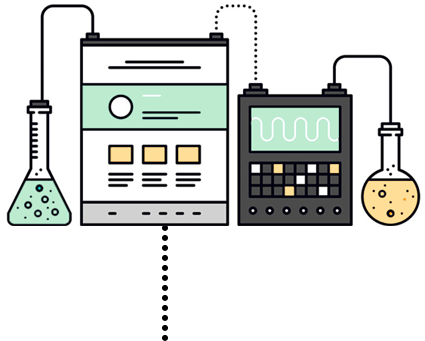 Below we have listed some other resources you can use to learn how SEO works. While it’s not extensive it is exclusive and highly curated. With this information, you should now have a better understanding of how SEO works and the steps you must take to achieve SEO success. Since 2010, SEO Mechanic has been identifying search marketing opportunities with software, data, and human intelligence. Our mission is to be transparent with the work we do and never employ pushy sales tactics. If you would like to talk about your SEO strategy, please contact us today to discuss.